We warm up some fat-free refried beans, heat a fat-free tortilla, and then spread the beans all over one side of the tortilla. 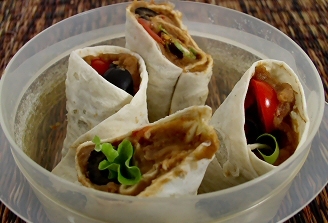 Then we put a strip of black olives, grape tomato halves, and lettuce down the middle and roll it up, jelly roll style. I cut it into four pieces and pack them in a cheapy plastic container (see photo). E. says that these stay nice and soft and she doesn’t need to heat them up (which she could do since she has access to a microwave).